There are a lot of courses and articles about coding but much less about putting it in production. With a lot of questions asked, I decided to write this ultimate (hopefully) guide to deploy Laravel projects. Notice 1: please take this article as personal advice but not 100% accurate process. Every team have their own way to deploy projects, so you may read different advice elsewhere. Notice 2: this article is written in October 2018, check for any updates to software and Laravel/PHP versions at the time you’re reading it, IT world is constantly changing. I’ve recently written a recommendation article for the server needed for Laravel projects. My personal preference is Digital Ocean. They have their own guide for Laravel projects. Part 1. Create/purchase your dedicated server. In case of Digital Ocean it’s called Droplet, Amazon AWS call it EC2 instance etc. Notice: Linux-server is the reason I advise to use Linux environment on local computer, too. This way you get used to configuration. But don’t worry, you don’t need to install Linux or buy specific new computer – it all can be emulated with Laravel Homestead or Laravel Valet. Part 3. Configure SSH access for yourself. You will probably deploy changes by SSHing to the machine and running commands like git pull, php artisan migrate etc. Forget uploading via FTP, if you still do it. Learn more about users/privileges for SSH access in this Digital Ocean article. Part 5. Install/configure composer. You do want to run composer install command on the server, right? Follow the instructions from the official GetComposer.org website. Part 6. Install/configure git. Putting the code to the server will work by pulling it down from git repository. Probably this official instruction will help. Part 7. Configure MySQL. You need to create a database specific for your project, and a user to access it. You may create a separate user, granting only specific privileges. Digital Ocean have article on it, too. Part 8. Configure Web-server. Prepare a specific folder for your website. Here’s an example Nginx config provided in official Laravel documentation. Part 9. Point the Domain to Server. Your new server probably has some IP address given to you by Digital Ocean (or other provider), so now you need to go to the page of your domain configuration (where you’ve bought the domain) and change its DNS records, specifically A record to point to that new IP address. Here’s article on Quora about it. Ok, at this stage, if you’ve completed all of the above successfully, you have your server ready. Not that simple, huh? To avoid all that manual work, I totally recommend using Laravel Forge – it prepares the server for you, with all the correct settings, in just a few clicks. If you work with multiple clients, totally worth $19/month (this is the most popular plan price at the time of writing this article). Also, you support Taylor Otwell and Laravel by using Forge. Now, as we have server ready, let’s put the code there. Part 1. Putting the code to the repository. Choose the system you want to use – GitHub, Bitbucket or Gitlab. Then create a repository there and push your code from your local computer. Let’s take an example of totally fresh Laravel 5.7 project. 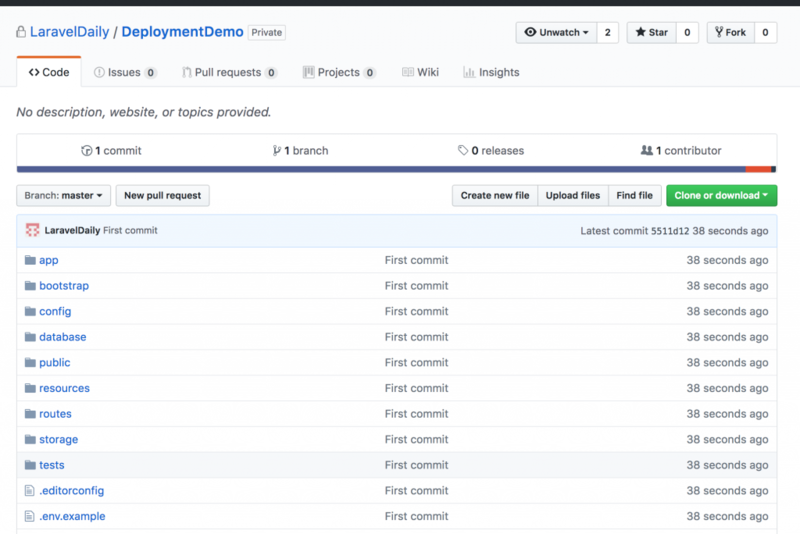 Now, if you pushed your code to Github, your repository should look like this. Part 2. Cloning repository to the server. We need to SSH into our server, navigate to the folder prepared for the project, and launch git clone command. Or you can set up the access following these instructions. After cloning is successful, we should see the files downloaded to the server. This means that we haven’t run composer install. But to do that, first we need to configure our environment. Laravel comes with a file called .env.example, with all typical configuration values. So set up your app URL and database credentials. Everything else can be edited when you actually need it. Directories within the storage and the bootstrap/cache directories should be writable by your web server or Laravel will not run. Part 5. Composer install. Let’s run this “magic” command. On this step, you may encounter some errors if some packages are not compatible with your PHP version or extensions. So check for any messages. It generates a random key which is automatically added to .env file APP_KEY variable. Please make sure you’ve set up correct database credentials in .env file. Part 9. Launch! Finally, let’s try it out in the browser… It works! Congratulations, if you’ve reached this far, you have deployed Laravel project to your server! But that’s not the end of the article, let’s see how to work with this project and deploy future changes. Part 1. Artisan down. There is an Artisan command to get all the website “down”. 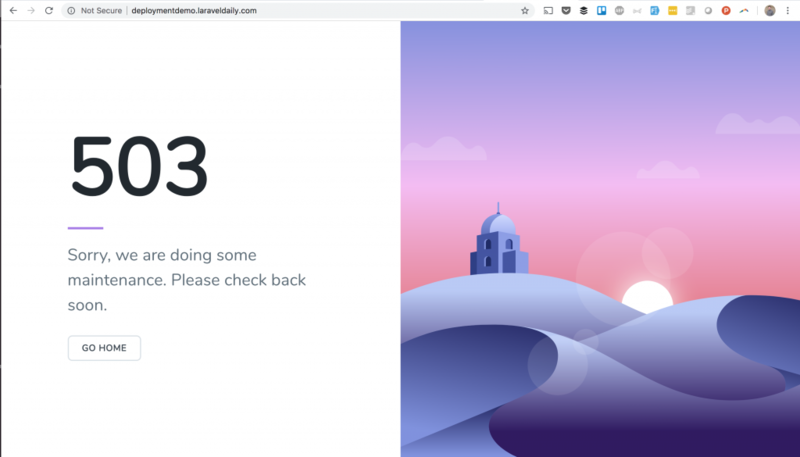 If you launch it on the server, the whole website becomes unavailable, and then you can do any deployment actions, and your visitors won’t interrupt you. Otherwise you’re at risk the someone will change some database data in live mode, which may even break your deployment. You can add more parameters like branch, but we will be talking about branching strategy a little later in the article. Part 3. Composer install. Next thing is to check if there are any new changes in composer.lock files, so run composer install. Important notice: don’t run “composer update” on a live server. It will take a lot of time (a few minutes) and will break repository consistency. During committing to the repository, you will have both composer.json and composer.lock changed. That’s ok. If you do composer install on the server, it will look into composer.lock and will do only the necessary changes, without checking all of the versions for all packages. Actually, run this anyway, even if you don’t have changes. It won’t error, just will say “Nothing to migrate”. But important notice: don’t edit the migration files if they are already in repository, for every change add a new migration file. Change 7.1 version here to your real PHP version. Part 6 (optional). Restart queues. Part 7 (optional). Clearing cache. Part 8. Up and running again! And that’s it, let’s get the site working again. You probably think that it takes a lot of time to (properly) deploy the changes. While you’re running various commands, and investigate potential issues, visitors may be waiting for the site to be working again. For minutes. Not cool. This way, your customers experience absolutely zero downtime – symlinks happen almost instantly. There are a few tools that arrange this zero-time deployment for you, with ability to rollback to a different folder, logging the process and report about errors. 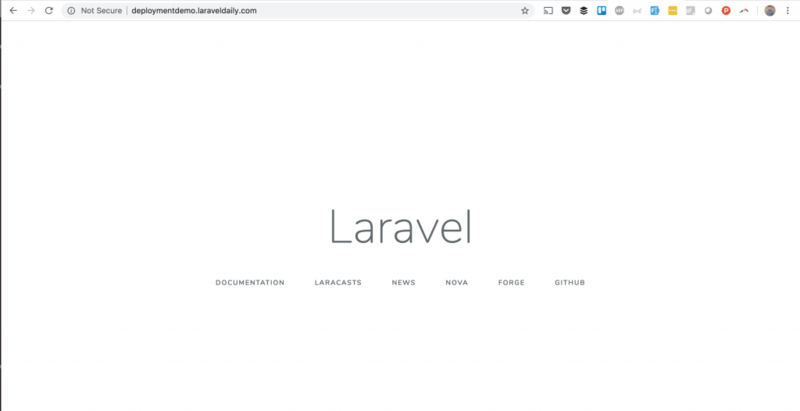 My favorite is the official tool by Taylor Otwell called Laravel Envoyer. 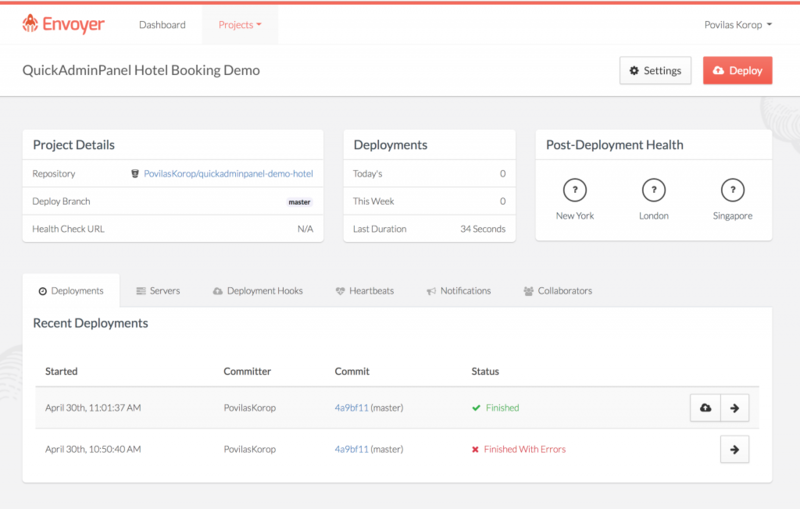 It’s not as valuable as Laravel Forge for server provisioning, but if you want to have one-click zero-time deployment, try it out for $10/month. Let’s take one step even further. How do you deploy the changes, while working in a team? And not necessarily sitting in the same office or even working within the same timezone. How do you not break each other’s code? There are quite a few options to organize this process, but here’s the process I would personally recommend. When you’re ready to release some function to live version, it should be done in develop branch and tested (manually and maybe with automated tests) on staging server. Then you do a Pull Request in repository, which merges develop into master. Pull Request may be reviewed by teammates, and then officially approved/merged. Then live server pulls the code from master. If someone is working on a bigger feature, they should create so-called “feature branch” from develop branch, and then at some point do a Pull Request from that branch into develop (not master!). Likely there will be code conflicts to merge manually and talk between teammates. Don’t leave APP_ENV as “local”, it should be different (but not “production”). Also, APP_DEBUG=true means it will show errors with all trace, as it should for testing purposes. But don’t forget that on live server it should be strictly APP_DEBUG=false, otherwise you have security issue. Finally, put your server’s URL as APP_URL. Simple. Have a separate database for staging server. Don’t ever play around with live data for testing. Finally, if you have any external services like Stripe, don’t forget to put their sandbox/testing credentials in .env file. Or, for email sending, you can use a separate driver and service like Mailtrap. Kind of a separate “advanced” topic of deployment is you may want to run automated tests on a separate testing server. 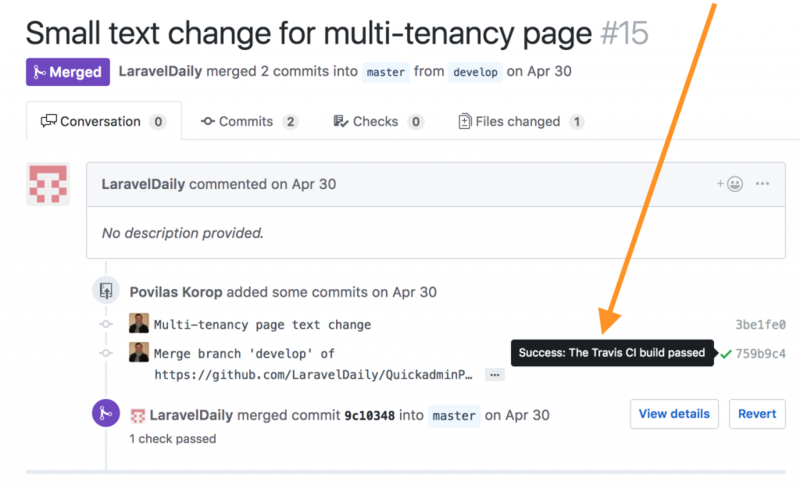 You can set it up manually or use tools like Travis CI, CircleCI, or Jenkins. You have written automated tests – unit, feature, behavior or other type of tests. Check awesome course Test-Driven Laravel for this. You have prepared database seeders to run and create a new fresh database with some dummy data for running your tests. Every time you commit code to develop branch, testing server pulls it and runs the tests, informing you whether code is “safe” to go live (but don’t trust that “green light” blindly). In ideal scenario, which is called Continuous Integration, everything is automatic – developers just commit their code, and system informs the team if some tests fail. But it can be done in more simple and manual way – just have basic automatic tests and run them manually by typing phpunit on your staging server. Just don’t forget to prepare the database for it – with seeders and fake data (recommended) or some testing semi-real data (be REALLY careful about it). After successful (or not) deployment you may configure notifications to email or Slack, it depends on what repository system you use or what auto-deployment tools like Envoyer. Here’s how Laravel Forge informs us via Slack. Again, please take this article as advice for “typical scenario” but keep in mind there are dozens of other ways to deploy projects, and you may here different tips and processes from other teams. Come up with your own process that is suitable for you! Thank you very much!!!!!!!!!!!!! ačiū jums labai!!!!!!!!!! How do you handle building frontend assets? Having node installed on the live server just for build seems like the same bad practice as commiting these assets to git. Not sure about bad practice (I’m a back-ender with only some front-end knowledge), but we have node installed on the live server. Why is committing assets to Git bad practice? Is it any different than committing lock files to Git? Great article. Everyone ignores the “future updates” part which I think it is more important. But one question, is this zero downtime real? Lets say envoyer copies my new files to the new folder and runs migrate, and at the same time my old files which are still live requests something that was in the old migration (a db field that got deleted). Will that error? Because the database is the same. Great comment, Amin. Yes, you’re right, with DATABASE it’s not exactly zero-downtime if migration operation takes time. And there are various ways to deal with it, that tweet is one of them but sounds really complicated. If downtime is 5-10 seconds, I would probably just run php artisan down for that moment to stop all DB operations. If it’s more sensitive with huge amount of data, then probably Envoyer is not for you, and you would have to create your own script/process for deployment. I currently use CircleCI and Envoyer, where once tests have successfully been completed, CircleCI informs Envoyer to do a new release during the deploy step and a simple curl call. This works great but one problem I see is wouldn’t Envoyer always checkout the latest commit against the targeted branch? What if for example, the Master branch receives 2 simultaneous commits? CircleCI will run tests on the first commit, then inform Envoyer and proceed with running tests against the second commit. Envoyer on the other hand will run a checkout and see the latest, 2nd commit and proceed to create a release against that, before CircleCI even has a chance to complete running tests on that second commit. Wouldn’t that be a problem? If so, how would one get around that? Admittedly at the moment, I only make commits directly to my Master branch so I can see this issue happening more frequently with rapid commits. If I move to using a dev branch before merging all changes to Master, wouldn’t this just improve my chances of this problem not occurring and not actually make it go away? It’s hard for me to comment, because I haven’t used CircleCI, only Travis CI. But general logic should be that you shouldn’t trigger Envoyer immediately after CircleCI, or trigger it with some other condition – when ALL tests pass from all commits. Hi Povilas, excellent article – thank you. I deployed my site using Forge to a Digital Ocean droplet (LEMP). I’m using PHPjasper for reports and my app online works fine except for reports, it bombs trying to connect the report engine to the database. My app connects fine, so I know the dB connection parameters work. I get an obscure error saying the database name is missing, but I can see it in the parameters being passed. My app works fine locally using Laragon with Nginx & MySQL same as my droplet. I can’t find any reason this shouldn’t work. The only difference I can see is that the working host is Windows and the server is Ubuntu. Any ideas how to figure this one out? Hi Stephen, sorry I haven’t worked with PHPjasper so can’t provide any advice. I was wondering if you run these optimizations, and other scripts on the deployment page, before doing a `git commit -m””` locally or do you run this on laravel forge/envoyer? 3) deploy via envoyer or forge? These should be done on the server side while deploying. That’s part of the reason why Envoyer is so valuable – it makes no-downtime deployment, even if you have many optimization or other commands running while deployment. When we were working on the media library the other day (on this site), those media folders were committed. How do you keep local testing data from making it to GitHub? Do you use gitignore for folders like that? Are there other commands you use to prepare/remove non-live data from the local copy before the commit? public/storage folder (where, I assume, you have media files, after running “php artisan storage:link”) should not be committed to repository. Yes, it should be in .gitignore. No other commands, really, just gitignore. If you’re saving your media elsewhere, then it should be probably gitignored, too. So many little things, but I’m sure this’ll be old hat before too long.